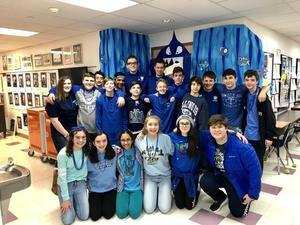 Today was class spirit day! Decked out in class colors, SJS students enjoyed the Eyes of the Wild program in the morning and participated in the Minute to Win It activity in the afternoon. A CSW favorite, the Eyes of the Wild introduced us to some really cool animals including the crowd favorite chinchilla and the not-so-favorite python. After a lunchtime movie and special pretzel treat, our students competed in the Minute to Win It activity where the Blue Team emerged victorious and will enjoy a free Tag Day next week! To view all the pictures from CSW Tuesday, click here.